GamesFirst! || Student Declared Witch and Burned for Making In-Game Map of High School. home > editorial > happening > Student Declared Witch and Burned for Making In-Game Map of High School. An honors student at Clements High School, Texas was recently removed from the campus, sent to an alternative school, and bared from attending graduation with the rest of his class. Why? Because two months before the Virginia Tech shootings he made a map in a yet-unnamed video game based on the layout of his local high school. While we don\'t know what game he was playing, yet, it\'s a fairly reasonable guess that it was for a first person shooter. According to the local newspaper, the student played on the map with some of his friends. When school officials found out, the student was arrested, though no charges were filed. According to reports, his house was searched, and a hammer was taken from his room as a potential terrorist weapon. Sources close to the case report that the hammer was used by the student to repair his bed. \"I used this as a teaching moment with my own kids and reminded them again about how careful they need to be in this day and age about what they say and do. I also reminded them the continued importance of reporting things they feel might be dangerous to themselves or others.\"
There\'s something truly unsettling about the realization that not only are parents cautioning their children about how they use their freedom of speech \"in this day and age\", but that such advise is probably a good idea. We are truly facing a circumstances where expression of ideas can constitute a terrorist act. Primarily this is because, in the wake of events like the Virginia Tech shootings, we stop being concerned with intent. Intent has traditionally been key to wrongdoing. By the letter of the law, it\'s impossible to commit fraud, for example, without the intent to commit fraud. Proving intent is a large part of a crime. No longer, though. No one seems concerned with proving that the student was using the map with any ill purpose in mind; they are simply intent on punishing with no technical violation. What law is broken to make a representation of a school? What code of conduct? Why is intent so important? Simple - determining intent is what separates an actual trial in these sorts of issues from a witch hunt. 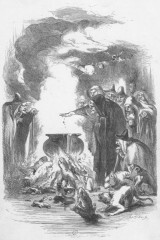 A witch hunt happens whenever society begins persecuting the symptoms of a crime over the actual wrongdoing itself. Can\'t find a witch that is actually casting spells and throwing around curses? Instead find people that match the general characteristics of the witch - the wrong appearance, the wrong art hanging on the walls - and burn them instead. You overlook the fact that they\'re not really witches, because they seem convincingly scary. In other words, convict without guilt. That\'s the defining characteristic of a witch hunt. Did the student create a map based on his school? Seems so. Is there anything wrong with that? No, not without a lot of steps down a path that the student didn\'t seem to be taking. In fact, ironically, if he was making the map in a game like Rainbow Six, he was playing a game about fighting terrorists. He\'s being punished for taking steps that seem - in some people\'s minds - to eventually reach a negative conclusion. No one seems interested in whether or not this student actually represents a danger to the community; indications are that he didn\'t. He wasn\'t a loner. He wasn\'t antisocial. He had no weapons or evidence of hostile intent. Yet he shared characteristics with a witch. He made a map for a video game that was based in his school. For all given purposes, he was casting spells and giving the evil eye. The real advice that parents should be giving to their children is not simply to watch what you do or say, it\'s to never look like a witch. Because the truth is, being punished for witchcraft only sometimes has to actually do with being a witch.